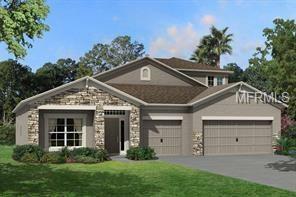 *UNDER CONSTRUCTION* Located within K-Bar Ranch, Briarbrook is a gated, private and beautiful community known as “a masterpiece community in the heart of New Tampa, ” and featuring single-family homes that are specifically designed with you and your loved ones in mind. This floor plan offers all of the great things about the Corina II, plus a very large upstairs bonus area for all to enjoy! Upon entering the front door, you are greeted with a welcoming foyer leading into the house. To the side, you will come to a split hallway with a bedroom on each side and a bathroom in between. Further down the entry way, you will find the laundry room on the side past the standard 3-car garage! Beyond that, you will enter into the open living area, complete with a dining room, family room, kitchen, and cafe area. What's not to love about this amazing kitchen, which includes a very large island and plenty of counter and storage space? Off of the cafe is a sliding glass door to your patio (or optional lanai). On the side of the home, you will find a fourth bedroom next to a 3rd bath. You will also find the exquisite master suite, complete with 2 walk-in closets, dual vanities, a garden tub, and a walk-in shower. Once you head up the stairs, you will be amazed at the size of this bonus room. Measured at 20'8"x38'8" this room has plenty to offer, and also comes with a bonus bathroom; it's perfect for entertaining guests!